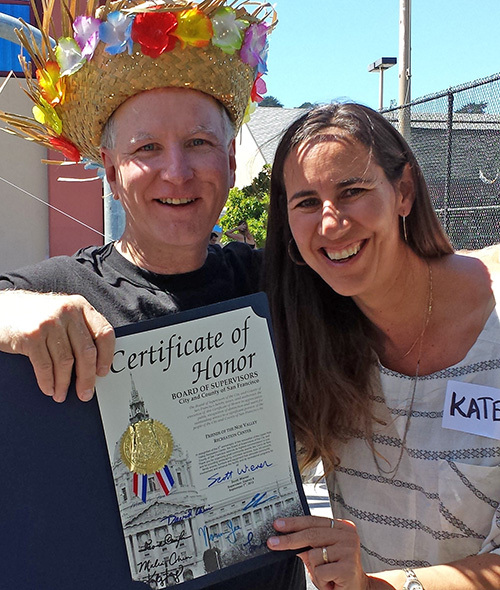 Chris Faust and Kate Haug accept an award on behalf of Friends of Noe Valley Rec Center at the Cinco de Noe celebration. Change is coming. Kate Haug has decided to step down as co-chair of FNVRC and remain on the committee in a non-administrative volunteer role, focusing more on the Ladybug Gardeners. Kate has been marvelous for our community, and we appreciate her years of service. Some of the Friends’ accomplishments that Kate steered to success over the past three years include regular Tot Concerts, community events like LitQuake, regular website updates and e-newsletters, two applications for the Community Opportunity Fund, and two very successful school fairs. In addition, during this time the Community Recreation Council developed with Friends' support and we were able to solve some needs with purchases like the sandbox cover and picnic table. I will continue my tenure as co-chair with Molly Sterkel that began last summer. I’ll also make sure that the newsletter gets out each month and that our website remains updated with reliable, quality news and information. While I’ve been with Friends for over five years, this past year has seen an increase in membership and activity that redoubled my commitment. The committee has been revitalized and reorganized with new membership and new goals. We have capitalized on the success of our Movienights, Tot Concerts and other events; our ability to lobby effectively for maintenance has improved; and we have worked well together to identify and fund improvements. The success of Cinco de Noe in September was the icing on the cake. FNVRC received kudos from Rec & Park, the Board of Supervisors and the Mayor’s Office for our outstanding dedication to this community. I am so grateful to our neighbors and local merchants who recognize the importance of Upper Noe Rec Center to the neighborhood and gave generously to support our mission. An integral part of the Friends network is the Community Recreation Council. We meet once a month. (Check our calendar for dates.) Everyone is welcome. Those who represent an organization, group or business in the neighborhood are particularly encouraged to join us to help Rec & Park be more responsive to the needs of the community. 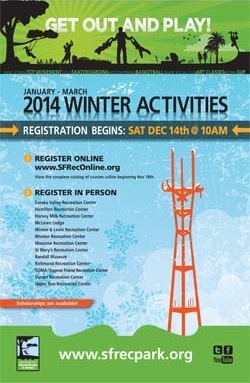 Registration for winter quarter starts Saturday, Dec. 14, at 10 a.m., and Upper Noe is offering something for all ages, from skateboarding to senior tango. There are cooking classes for tots, tweens and adults, martial arts for kids and adults, tot indoor soccer, acting, and tennis---lots of tennis. See the list of classes (listed by day and including descriptions) on our website. Registration can be done online or at any recreation center for any class. Click here to view the entire winter catalog. Upper Noe will host two girls-only sports classes called Racquets and Hoops that combine tennis and basketball. Girls ages 8 to 9 will play Thursdays from 3:30 to 5, and girls ages 10 to 12 will play Saturdays from 3:30 to 5. Girls interested in basketball only might want to try the 9-week course offered at Eureka Recreation Center on Tuesdays. Girls ages 5 to 9 will practice from 4 to 5:30, followed by ages 10 to 14 from 5:30 to 7. Registration starts Dec. 5 for the San Francisco Youth Baseball League, which starts the week of March 4. Children are divided into teams based on their age by April 30, 2014, and all games are played on Saturdays. Upper Noe is scheduled to field three teams. The Shetland Tball division is for children ages 5 to 6, Shetland Coach Pitch is for ages 5 to 7, and the Pinto division---which includes some kid pitching---is for ages 7 to 8. If a class is full at a particular location, you can wait list and we will try to form other teams with practices at or nearby that location. The $82 fee includes a uniform, a coach and entry into the SFYBL Baseball league. Register online here. The center will close early---probably at 5 p.m., says Facility Coordinator Cheryl Woltjen---on Christmas Eve and New Year’s Eve. All centers will be closed for Christmas and New Year’s Day. Some lucky buyers just snatched up prime real estate next to Joby’s Run with this lovely view. Upper Noe’s hallway, auditorium and playground are in the process of being re-painted and re-sealed, with the work extending into the first week of December. Call the center at 415-970-8061 to double check tot free play hours. The painter will cordon off sections of the playground so that it’s not all closed at once, said Facility Coordinator Cheryl Woltjen. The recent Federal shutdown gave us a glimpse of what will come if the Golden Gate National Recreation area’s plan to remove traditional dog walking activity from on our local beaches goes through. With Fort Funston and Crissy Field closed, McLaren Park and Bernal Hill became so packed with pooches that dog walkers started to overflow into and overcrowd tiny Joby’s Run. 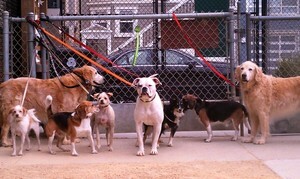 Inadequate consideration of the impact on local parks has moved the Board of Supervisors to oppose the GGNRA dog policy. • Garden at the Park. Help keep the park beautiful by volunteering with the Ladybug Gardeners on the second Saturday of each quarter. The last date of 2013 will be December 14. All ages welcome, no experience necessary, community service hours credited. Even an hour would be a big help! Please contact us at info (at) noevalleyreccenter.com. Bounce around, build the menorah and grab a latke---this year's Chanukah celebration happens at the new town square on 24th Street between Sanchez and Vicksburg. See complete calendar of events here. Train rides, entertainment, activities for kids, Santa, and the big tree in front of McClaren Lodge will be lit. Free! Donations of new, unwrapped toys accepted for Operation Dream. Presentation from the new Chancellor of City College of San Francisco, Dr. Arthur Tyler, followed by Q&A. Co-sponsored by San Francisco for Democracy and Upper Noe Neighbors.